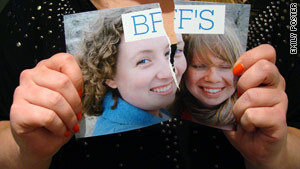 It's not friendship if the only reason you hang out is that you've know each other forever, says columnist. (The Frisky) -- Sometimes it is really obvious that a friend isn't looking out for your best interests, but we keep ignoring it just because we have known them for so long, or because they know so much about us that we just put up with their selfishness or craziness. Here are 12 signs it's time to drop a toxic friend like a hot potato. 1. The only time she's free to hang out is when her boyfriend has plans with his brahs. 2. Your cat, Fluffy, died and when you told her, she said, "Fluffy who?" 3. You've made some new friends you really enjoy spending time with and she can't stop bad-mouthing them. 4. When you ask yourself why you're still friends with her, the only answer you can come up with is: "We've known each other forever." 5. She makes the same mistakes over and over and over, expects you to listen to her whine about how unhappy she is, and then snaps at you if you suggest she changes her behavioral pattern. 6. You tell her you're engaged and her only reply is: "You better not make me wear some ugly bridesmaid dress." 7. You make a point of reaching out to her, but you can't remember the last time she called, texted or emailed you. 8. She skipped your 30th birthday party because she had "cramps." You realize she has "cramps" every time the focus isn't all on her. 9. When you suggest she might try therapy because she's always in the middle of some crisis or other, she smiles and says, "But that's what you're for!" 10. She "calls dibs" on a cute guy you both spot at a party and when you start to argue, she puts her hand up and says, "You aren't his type anyway." 11. You make more money than she does, so naturally she expects you to always pick up the check. 12. She borrows your favorite leather jacket and looks ten times better in it. Unacceptable!